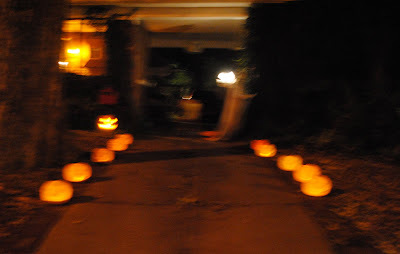 I love Halloween -- I love the children all dressed up for trick or treating and we like to make Halloween special for them at Linderhof so . . . .
We line the driveway with lighted pumpkins to light the way for the children . . .
enter the witch's lair -- which is guarded by Igor! The children make Halloween fun!!! It's Wednesday and time for Outdoor Wednesday. We were grateful that Sunday night was not cold although it was windy. 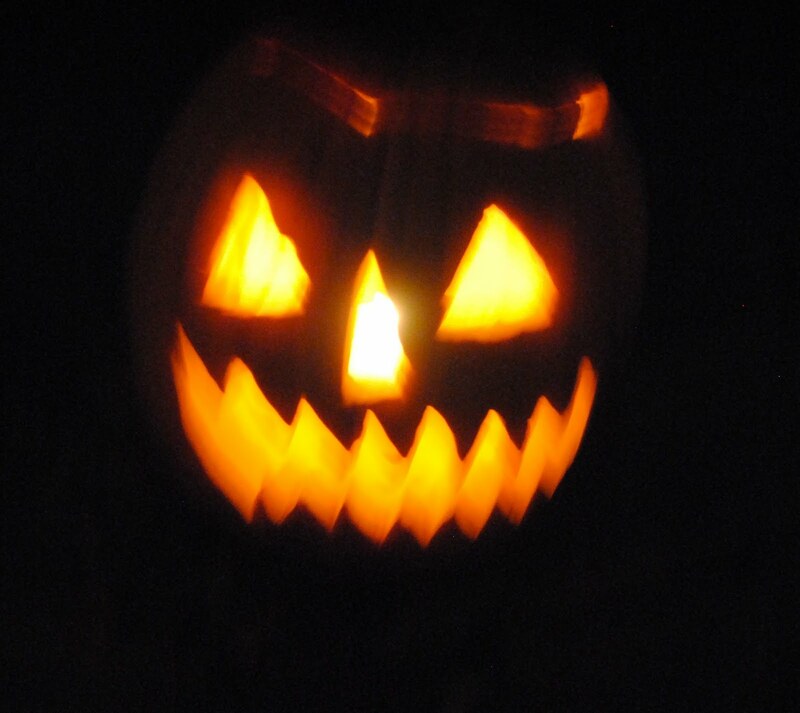 For it was a few hours outside while we passed out full size Snickers to each and every trick or treater. Please join Susan at A Southern Daydreamer to see other things outdoors this Wednesday! You must have the most popular house on the trick-or-treat block. We were lucky we got 4 groups of kids -- our most ever at this house. Thanks for the big laugh! Terrific. I love Halloween too! Snickers was the one candy that my parents let us keep--healthy you know!! We pass out bags of small Snicker's, Twix etc. I love your costume--that is you, isn't it? I'm sure that Linderhof is on the "must stop" list of every child in town. Cass -- Oliver likes to stay close to the action and so he stays on the porch -- sometimes he barks and sometimes he doesn't. If he does and a child inquires, I tell them that that is my cat, dressed as a dog for Halloween! Some kids do believe me!!!! What a year you've had with your surgeries. . .but you wouldn't let those neighborhood children down! I 'm so pleased that you were able to continue a Linderhof tradition. It is important for children to have tradition in their lifestyle; Linderhof will surely, one day, become a legend. 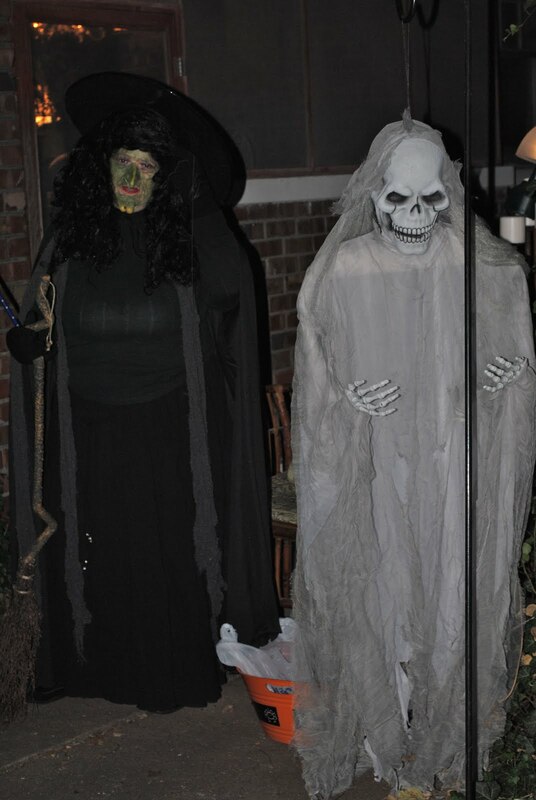 What a sweet tribute to the 'Joy of Halloween'. . .I can only imagine those faces to see a whole Snickers candy bar! ! ! Wow, what an effort you have made for the children. I'm sure you had just as much fun at Hallowe'en as they did!! Your photos are so lovely. I especially like the witch.